1st thing first: My name is App Shah and I’m a founder of Crunchify, LLC. I started my blogging in 2012 as a hobby and now working as a full-time employee. Our offices are in Texas, US and Ahmedabad, India. Our site is most popular among bloggers who are ready to learn the tricks of the trade to turning a blog into a successful Tech Professionals and Niche Bloggers. 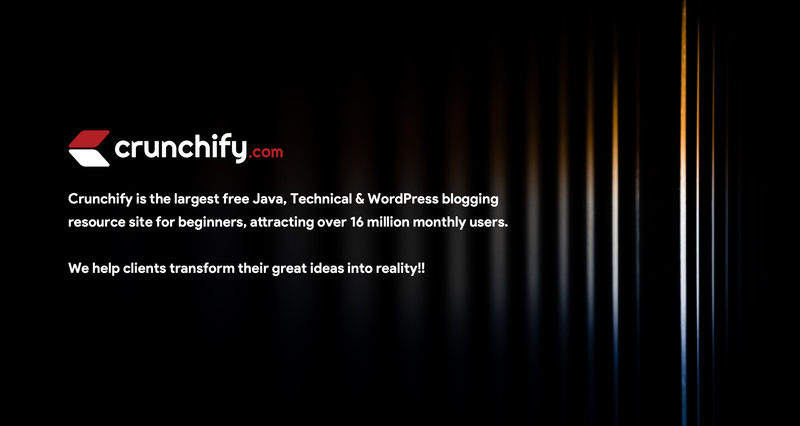 Crunchify is the largest free, premium, technical & blogging resource site for beginners, who are passionate & has the desire to excel in the online world. Attracting over 16 million monthly users, we are leading & trusted tech + blogging resource for all. We also help clients transform their great ideas into reality! WordPress, Marketing, Content Blogging, Search Engine, Genesis WordPress Framework, Affiliate Tips, Best Web Hosting Tips and lot more. More than 600+ Tutorials in this category for your to explore. The only place to be if you wish to start and make a business out of a niche blog !! How to learn Java, J2EE, Spring MVC tutorial with all detailed steps? How to be a Web Development Geek? Are you passionate about Blogging and Online Business? Making money online with genuine niche topics? Ready to put sincere effort on your site and subjects? Crunchify has changed the life of over thousands of individual around the globe to learn Java and Web technology without spending a money online. Here at Crunchify, I share everything I have learned and continue to learn about turning a blog into a valuable resource for online free tutorials. One of the ideology of my working is to be transparent and to the point. My goal is to teach Web Development, WordPress Blogging in general, and all things related. Want to hire us? We are here to help. Explore our Services & well-crafted Digital Goods. If you have any other general query related to this site then you can contact me here!